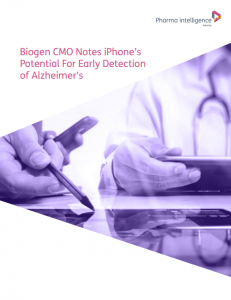 Biogen’s chief medical officer says iPhone technology should in future be used for early warning diagnosis of Alzheimer’s Disease. Biogen CMO Alfred Sandrock has told a London neuroscience forum that constraints impeding CNS drug development include the fact diagnosis needs to be done earlier but that barrier could be mitigated in future by digital health solutions such iPhones used as “early warning” diagnostics, notably in Alzheimer’s Disease. “For Alzheimer’s, even thirty years before the disease starts, the process begins, and the idea is that there will be subtle changes that your iPhone can detect – symptoms that you or your spouse may not detect but which your iPhone may. So, you’d get a blood test and that would indicate you have a high likelihood of the disease process going on in the brain,” Sandrock told specialists attending the World Neuroscience Innovation Forum in London March 27.